Earlier this year I had the great pleasure of being a guest of the 2014 Emerging Writers' Festival in Melbourne. As one of the five EWF ambassadors (the others being the superb Benjamin Law, Krissy Kneen, Maxine Beneba Clarke and Felix Nobis), I appeared on several panels during the National Writers' Conference. The first panel was called 'The 5 x 5 Rules of Writing', where the other ambassadors and I each shared the writing advice we wish we had known when we started out. I thought I'd reprint my five 'rules' here, for my own reference as much as anything. These are five things I continually need to be reminded of, and they never fail to help me remember how and why I write. This is perhaps the simplest, most worthwhile piece of advice I can give any of you today, and this is why it's the first of my five. To be a good writer you must, first and foremost, be a good reader. How else will you learn what to do? Read as much as possible, as often as possible, and if you read something you like, or something that makes you laugh, or something that moves you in a strange, ineffable way, ask why. Re-read it. Read it aloud. Pay attention to the use of words, and the narrative voice, and the comic timing. If you don't understand words, splurge on a really great dictionary and look those words up. The more words you know, the greater your control over language. Read everything. How else will you work out what is good and what is bad? Give your time to Thomas Hardy, Dostoevsky, Doris Lessing and Dickens, but also read debut novels, genre fiction, contemporary fiction, history books, plays, TV scripts, poetry and memoirs. If you can't afford new books, buy second-hand books. If you can't afford second-hand books, get a library card. Get a library card anyway. I've always loved reading, but I don't think I ever understood how crucial it is to bettering writing practice until now. If I'm writing and I find myself in need of inspiration, or renewed focus, I will always go and read. Nine times out of ten I return to my work refreshed and exhilarated. I used to worry that if I read a great deal while writing I would somehow mimic the authors I was reading. Now I realise that this rarely happens, and if it does, then I'll probably be the only person who notices it. Read. My second piece of advice is a bit of a strange one, because it's also a life skill: to cultivate empathy. Empathy is quite different from sympathy, which is a feeling of pity for others' misfortune. Empathy is the ability to understand and share the feelings of others. Empathy is about putting yourself in other people's shoes. The benefits of empathy for a writer are manifold. Empathy will enable you not only to write about characters who are very different from yourself as an individual, but to understand them too. It will help you create character motivation, backgrounds, voice. Empathy will enable you to more fully understand that every person is the protagonist of his or her life. Every character, even if they have limited page space, is - off the page - the central player in their own drama. Empathy will help you realise that everyone wants something, and that conflict - so crucial in nealy all genres of writing - often arises when desires cannot be met because of external circumstances, because of an individual's contradictory desires, or because other people have demands that are oppositional. This is as true of life, as it is of fiction. Empathy, put simply, will give you a keener insight into the human heart. There are many ways to improve your capacity for empathy. Reading literary fiction was recently proved to increase one's ability to decipher others' emotions and motives, or in other words, one's ability to empathise. You can also practice empathy in every social interaction you engage in, simply by trying to see where other people are coming from. I recommend people-watching from time to time. Ask yourself what someone might be feeling and why. Look at people on the tram and try to work out what they want. Empathy will help you forget yourself, so that you might write about wider worlds. Empathy will help you move beyond the parameters of your own individual experience. It will enable you to not only write what you know, but to write convincingly about what you want to know. My third piece of advice is, again, simple. Work hard. It's one thing to have a proclivity towards writing, or even an aptitude for it, but raw talent doesn't count for much in the long run without hard work. In recent years I've had an opportunity to reflect on what quality has best served me in my own writing. I used to be very thankful for what I saw as my knack for literature. When I was a teenager I loved English classes because I found them easy. I understood basic rhyme and meter on an intuitive level, and I could come up with some fairly good sentences without much stress. I always assumed that it would be this flair for language that would secure - one day, fingers crossed - publication. I was wrong. If there is one quality I have consistently drawn upon to get any kind of writing in print, it was not a gift with language. It was diligence. If you want to write, you have to be diciplined. You have to put the hours in, even when you don't feel like it. You especially have to learn to write when you are uninspired. You have to take your work seriously, and this means setting aside time for it, preferably on a regular basis. This often means making sacrifices. Working hard and becoming disciplined in your writing also means developing a professional attitude. This means that you forget your ego. It means that you actively seek and pursue opportunities to further develop your skills, or that you push yourself out of your comfort zone. A professional attitude means that you hold yourself accountable, that you honour deadlines - even those you set for yourself - and that, in your dealings with others - be them other writers, editors, or anyone else in the industry - you are respectful, considerate and well-mannered. So be diligent, because diligence will serve you better than lashings of natural talent. Be industrious, and pursue your writing with careful and persistent effort. My next tip is something I wish someone had told me ten years ago. Don't wait until you feel ready to write. Start now. Expect writing to be difficult. It seems obvious, perhaps, to say this, but still, it's worth saying. Writing is hard. It's really, bloody hard. It comprises long hours of solitude, re-writing and self-doubt, and is the kind of occupation that is impossible to feel ready for, because so much is necessarily uncertain, unknown and unexplored. I had never expected writing a novel to be easy, by any means, but I always thought that eventually I would work out what I was doing, and this would mean I'd find confidence in my ability and my voice. 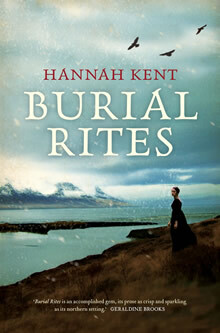 When I was halfway through the first draft of Burial Rites, and I was still plagued by a lack of confidence, I realised that my doubts about my writing probably weren't going to go away. And to be honest with you, they still haven't. I still find writing hard. The reason I'm telling you this is because I wish someone had told me how common it is for even established writers to have self-doubt. I remember, four years ago, reading that Sarah Waters had a 'Keep Calm and Carry On' poster in her study. It was a light bulb moment for me, because the presence of this poster implied that Sarah Waters had moments when she was not calm, when she felt out of control, or ill-equipped to write. In other words, the poster implied that she had the same moments of fear and insecurity I did. For many years, I felt that my writing was dependent on confidence. I remember waiting to feel ready. I remember holding out for my insecurities to ease. Thank God I started writing anyway, with all my self-doubt and apprehension, otherwise I'd still be waiting. If you have anxieties about your writing, and you're waiting for them to go away before you properly begin, my advice is to stop waiting and begin now. You won't feel ready. Writing is difficult, and your doubt won't dissipate overnight. Be patient with yourself. What will happen is that you'll become accustomed to the doubt and difficulty. You'll accept it as an intrinsic part of the writing process, and this preparedness will help you eventually ignore it. So acknowledge to yourself that writing is rarely easy, and that time doesn't make it easier. Brace yourself for the hard slog, be brave and do it anyway. After all, it is writing's difficulty which makes it beautiful. Don't expect it to be anything else. Just keep calm, carry on, keep going. Finally, I'd like to say this. Growing up, I heard writers say that it is necessary to write from the heart. I'd like to tweak this a little for you now, although for some, it may mean the same thing. Write from the deepest place within yourself, a place that is also wholly yourself. This doesn't mean necessarily that you must put your own story in whatever you write. Writing from the soul means to write about that which moves you at a profound level. It means to write about something which means something to you, or to write in order to discover meaning. Writing from the soul means to have purity of intention. Awards, advances, critical recognition - these things may come along, and they can be wonderful. But don't write for these things. You'll know when you're writing from the soul because the writing becomes the reward. And I promise you this: it is far more fulfilling than a cheque or good review, or even publication. Writing from the soul means to be yourself when you write. It means doing it for the love of it, despite the difficulty, the hard work, the self-doubt and the increasingly atrocious posture. And when I say love, I don't mean a casual fondness. I mean that you love writing with a kind of wild desperation, an intensity that both terrifies and exhilarates you. When I say write for the love of it, I mean write because there is no other way for you to breathe. So write from the soul. Write for yourself. Write for the love of it, always.